Here is a quick overview of the Varsha Rain guns. You can read more about the technical and application related features if the Varsha Rain Gun here. The use of rain guns saves up to 50% of water Vs conventional canal irrigation and meaningful power savings. Rain gun is suitable for a wide variety of crops. Cereals, vegetables, sugarcane, ginger, groundnut plantation crops. We are working on using rain gun for Dust Suppression application. IIT/S has been involved in the effort. 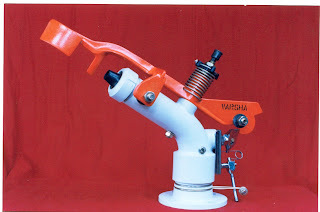 Read more about Varsha Rain gun's - technical and application related. Contact Us for further information. Write to us if you would like to explore opportunities with us. "Varsha Rain Gun" is a perfect cost saving application for our Indian irrigation methods. it's look professional and effective. i have a big grass surface. i think that product like this can be really fit. can i see the all catalog? With products such as Kerosene Burners & Stoves, Biomass Stoves, Plant Oil Stoves and Plant Oil Lamps, Servals has built its business by marketing innovations with the potential to transform rural India. Designed as a social enterprise, Servals wants to bring about a change in the life of the bottom-of-the-pyramid - to usher in an age of energy independence.